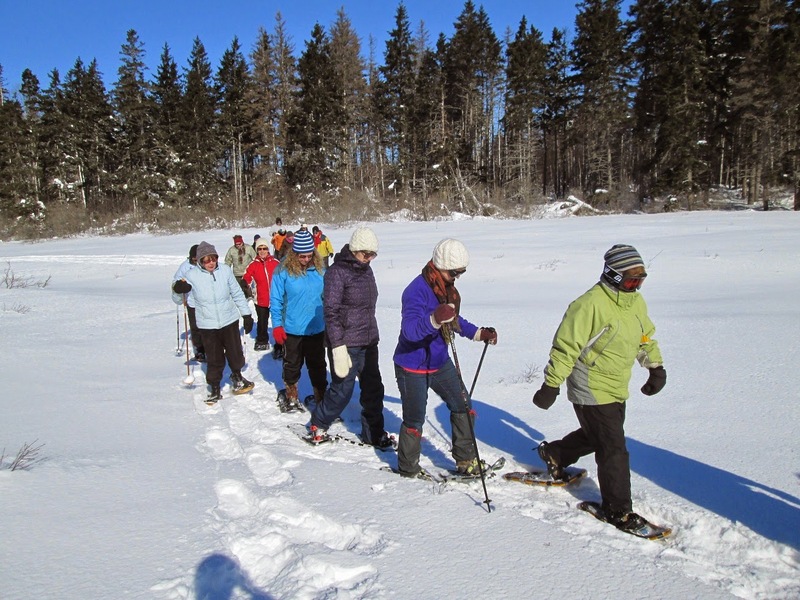 Today I was snowshoeing with a group in the National park in Dalvay, About 24-25 in the group. 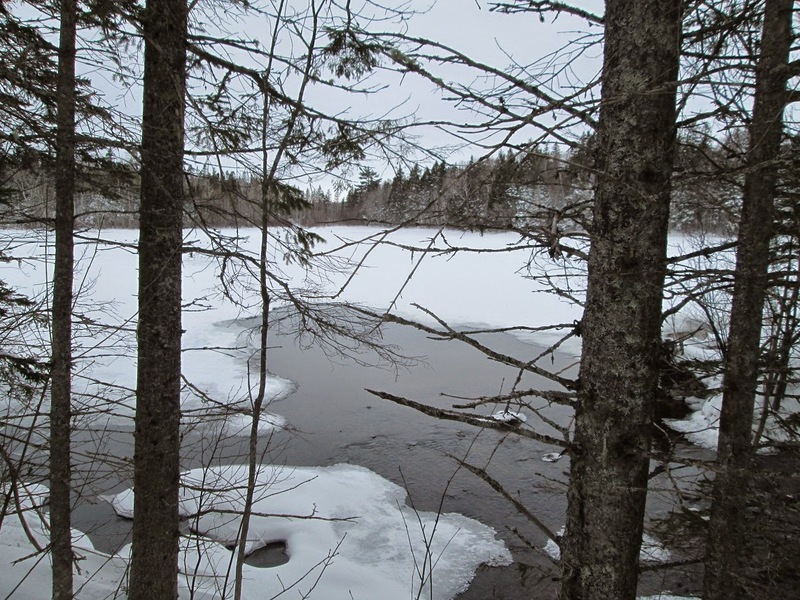 We were out on Long Pond for part of the hike. 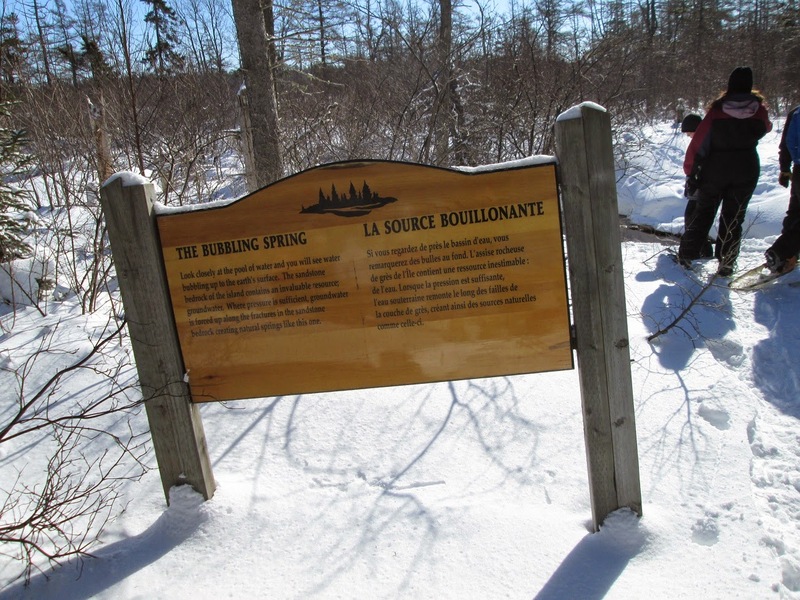 For most of the way we were on the Bubbling Springs trail. 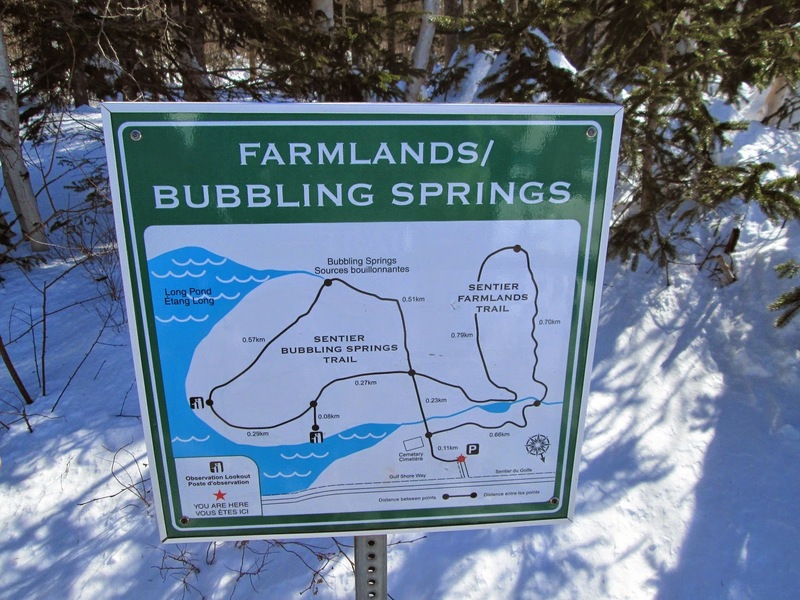 The Bubbling spring stays open even in the coldest days. It was -14 with a light breeze while we were hiking. All told we hiked a little less than 3 km. 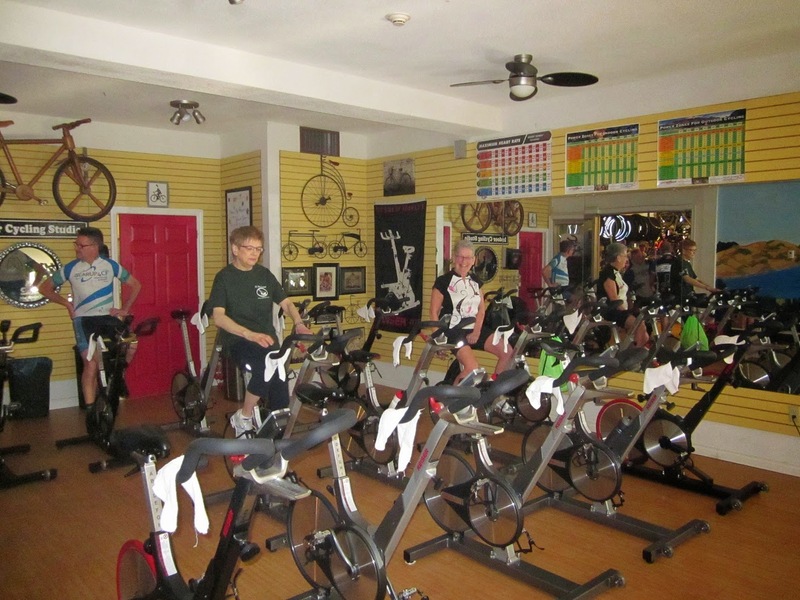 This morning as part of the 55+ games I did 45 minutes of spin cycling. 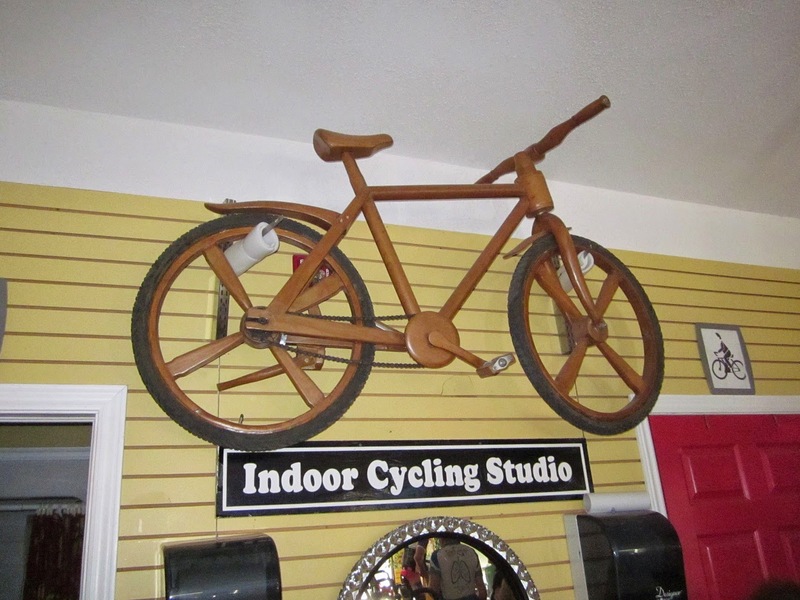 We were at MacQueen's bike shop & cycling studio. Late afternoon I was out on the snowshoes for 45 minutes. Sunny at -11. 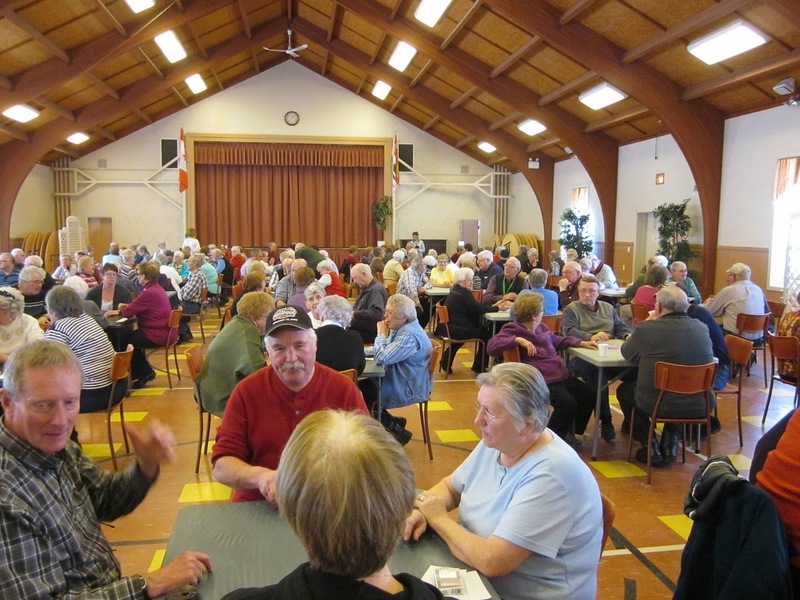 Today it was crib in the morning and auction cards during the afternoon, about 140 people playing auction. 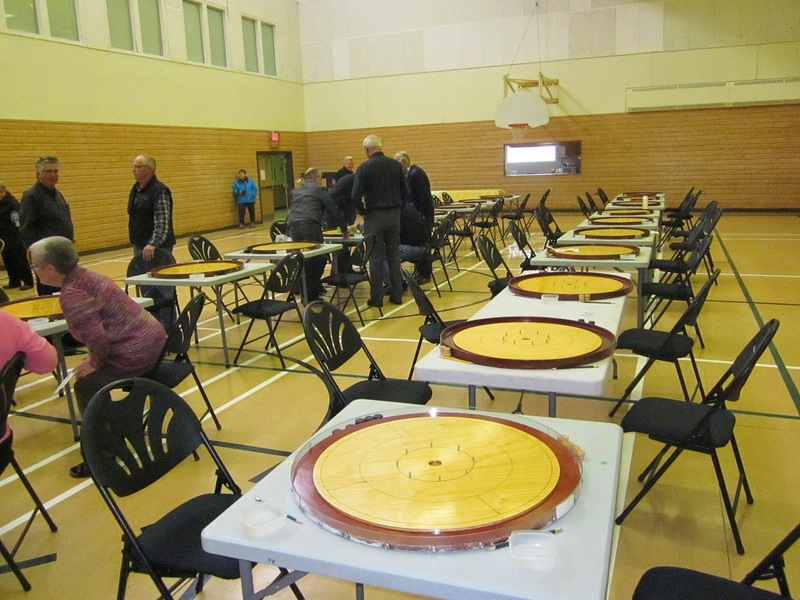 Today I was playing Crokinole in the 55+ winter games in Charlottetown, sngles in the morning and pairs after lunch. 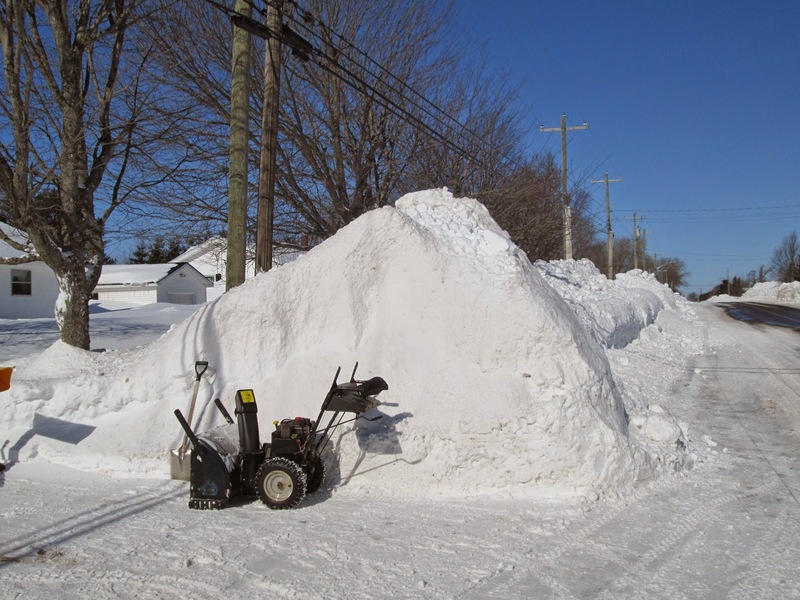 Between 2:00 and 6:00 we got another 15 cm of snow, I just spend 45 minutes clearing the driveway. The temperature was up to -1 today so it was wet snow. 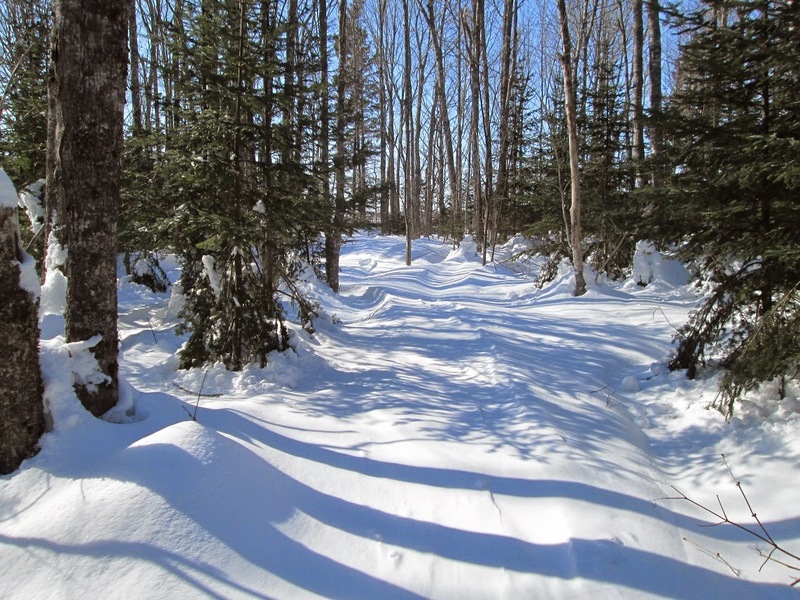 The scheduled snowshoeing at Cornwall was cancelled so I went though the woods off Ferry road. I was out for 45 minutes and saw two foxes in the area of this field. 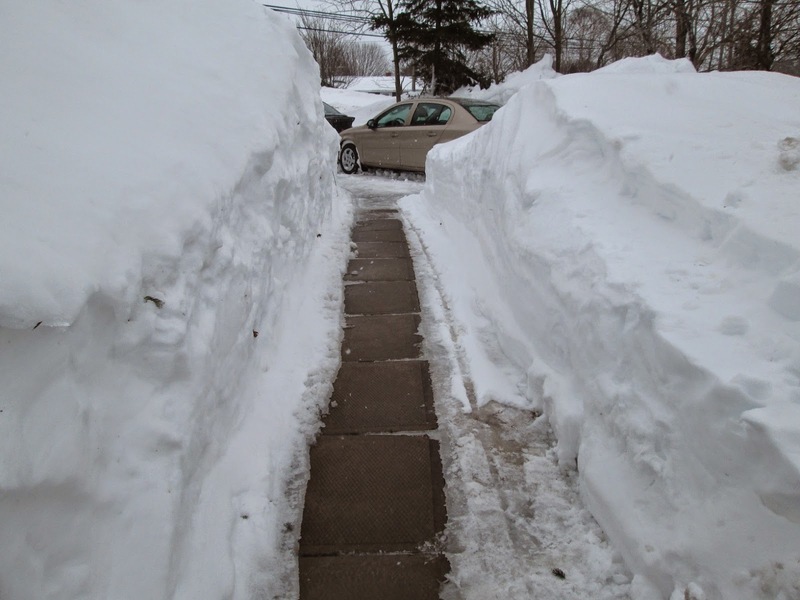 When I got home I spend some time shoveling snow, I wanted to open up the tunnel so the sun would be able to shine on the walk. Over night temperature was -24 wind chill -35 and the high for the day was -15. I visited the neighbors in the morning, after lunch I was to Hampshire to visit a brother. Late afternoon I went out on the snowshoes for 30 minutes. 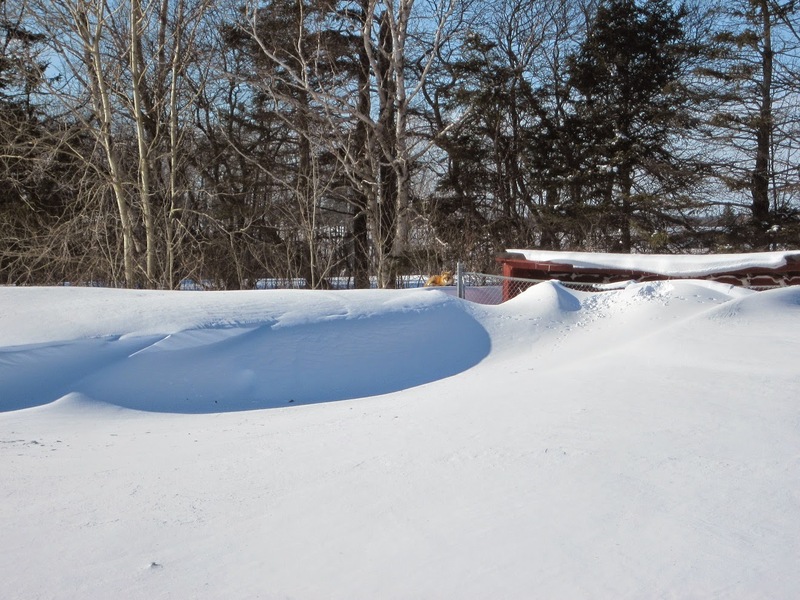 Lots of snow on the ball field, the fence and dugout almost buried by the snow. There was sunny breaks in the morning and light snow during the afternoon at -4. Temp was up to +3 with a little rain this morning. So I was able to get some of the walk bared off. And some of the driveway as well. 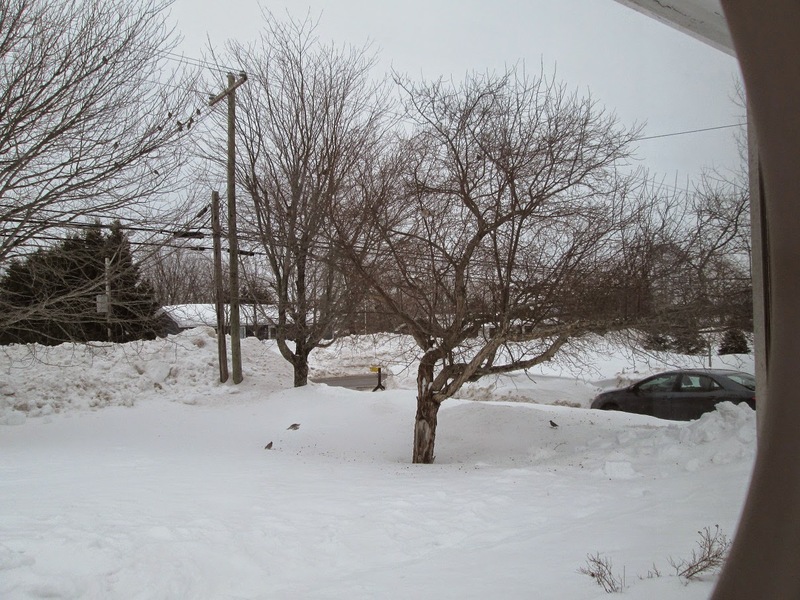 We had about 20 Cedar Waxwings enjoying the crabapples that were still on the tree. 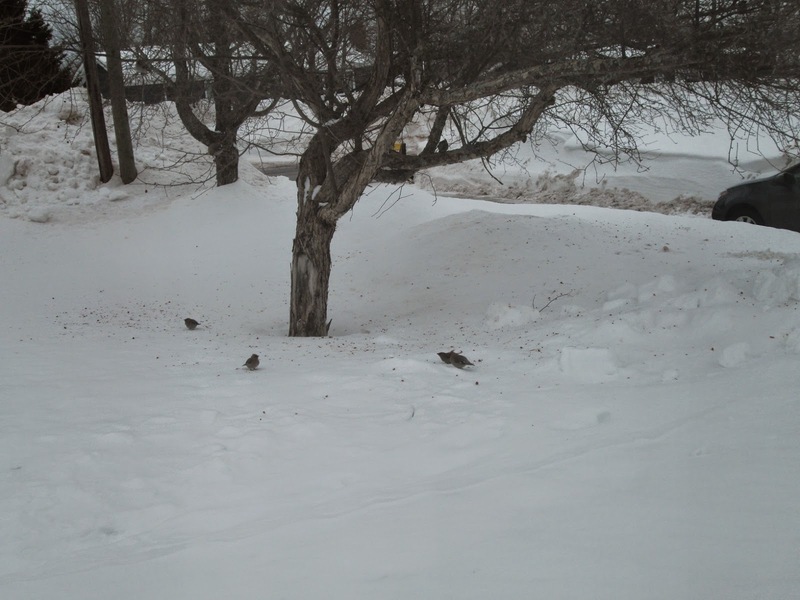 Some were eating the crabapples right on the tree but most were knotting the off then eating the crabapples off the snow. I was to the Farmers market this morning to get some apples. 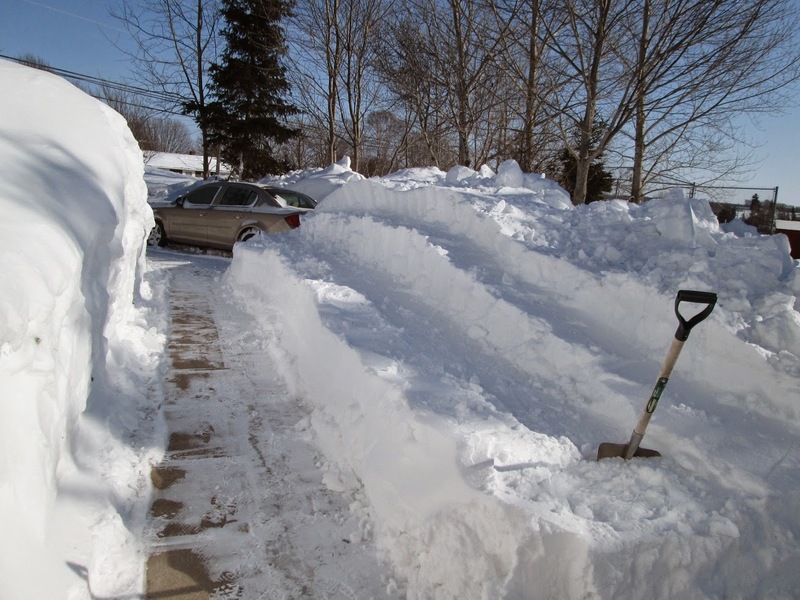 I just shoveled a opening to get out with the car, after I got home I used the blower to clean it up. 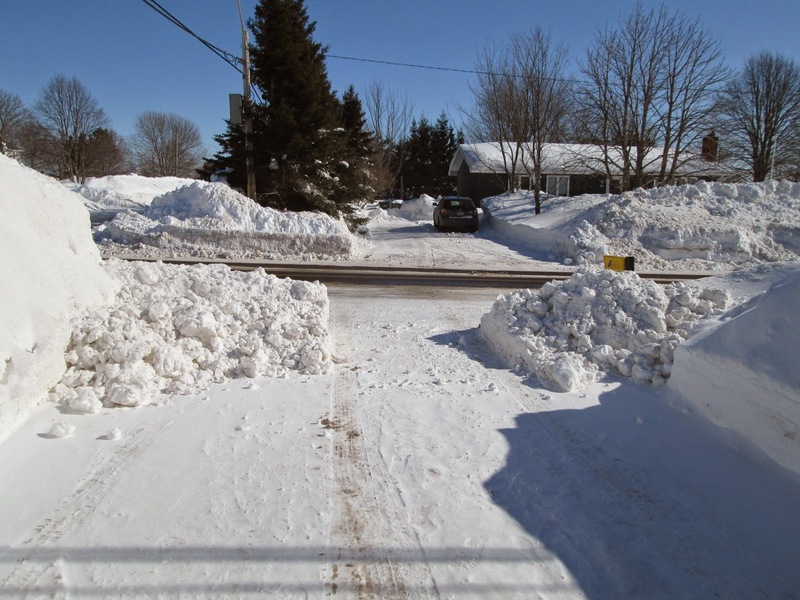 It is unreal the size of the drifts along the side of the road, the side where the sidewalk is must have three meters of snow on it, no effort by the town to clear the sidewalk yet. 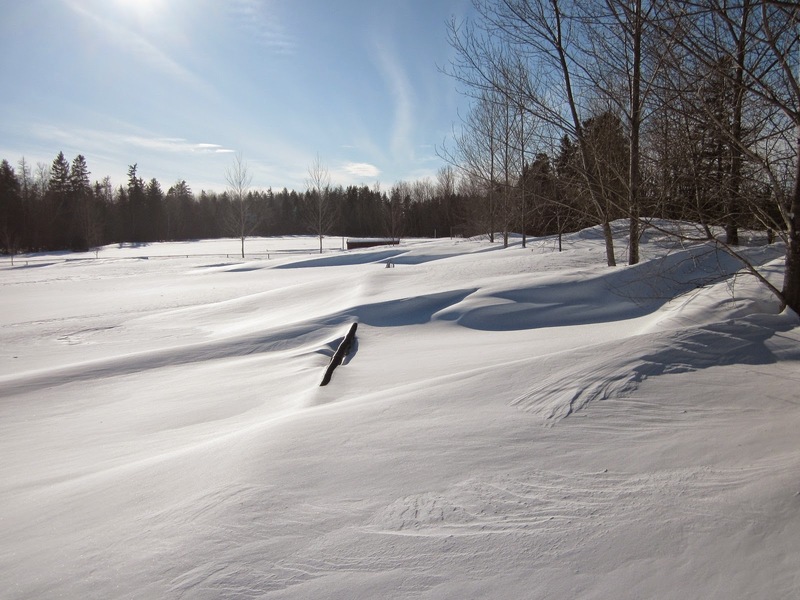 I was out on the snowshoes for a hour and went as far as the business park. 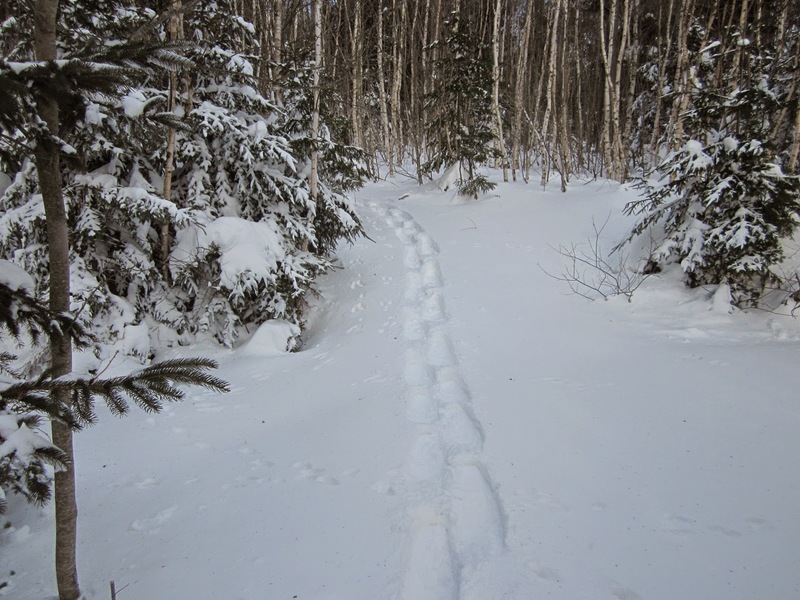 I met a neighbor on snowshoes while I was out. 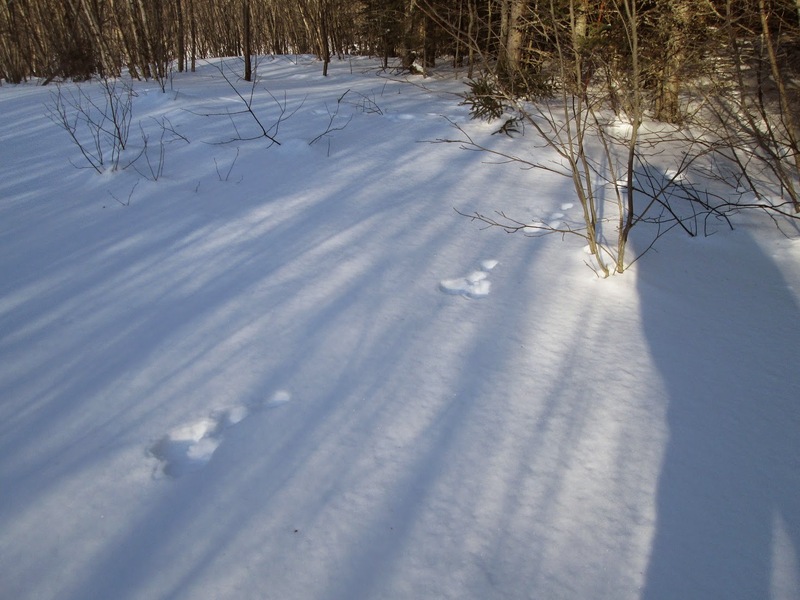 By the distance between the tracks, this rabbit was in high gear. Sunny at -8 with a light W wind. 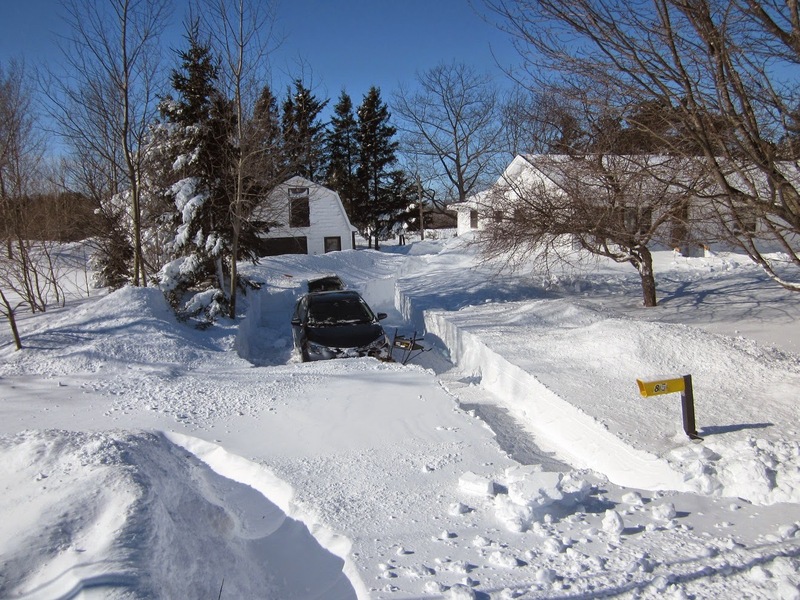 This morning the snowplow had pushed a big roll of hard snow into the driveway. 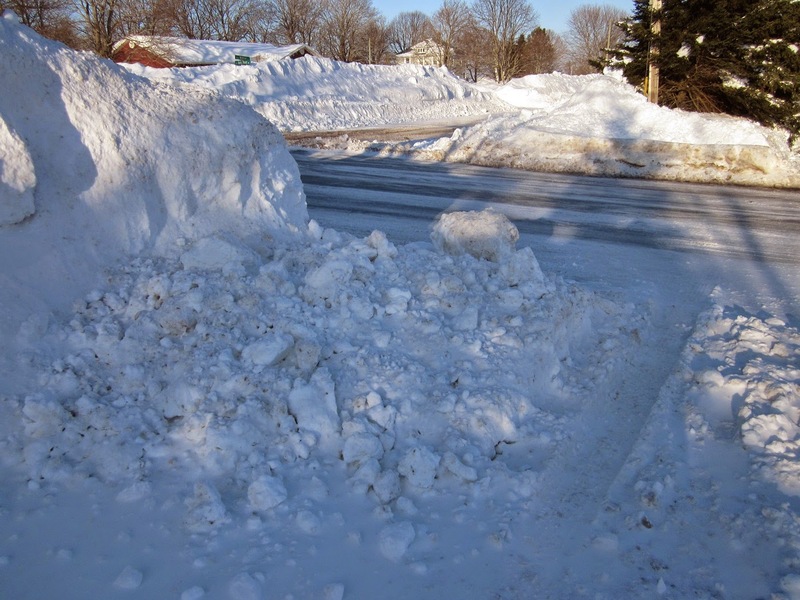 I had to use a axe to break some of the big lumps of snow but after a hour I had it cleared. Then when I went to go out at 2:00 there was another roll of hard snow pushed in. The photo is part of the second roll. 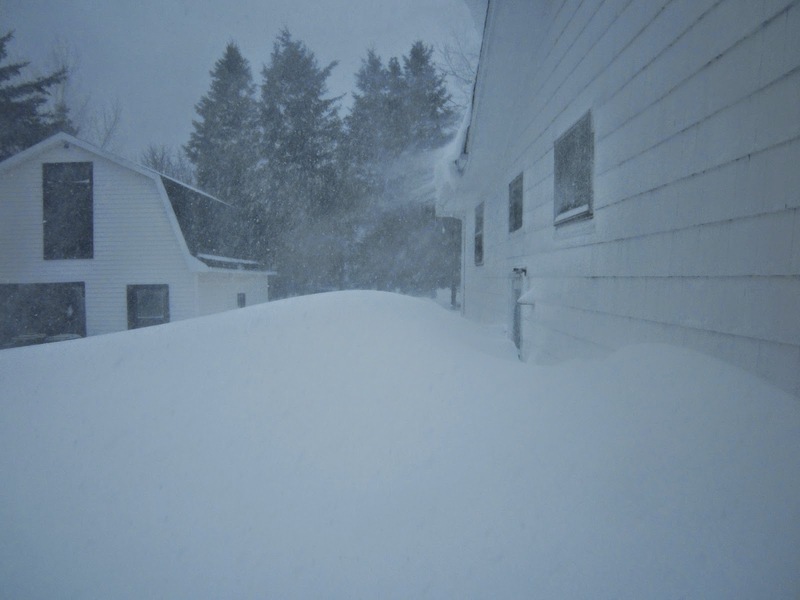 Note the street sign across the street, it is almost buried with the snow. The sun was still up at 5:05 but some clearing showing in the sky. 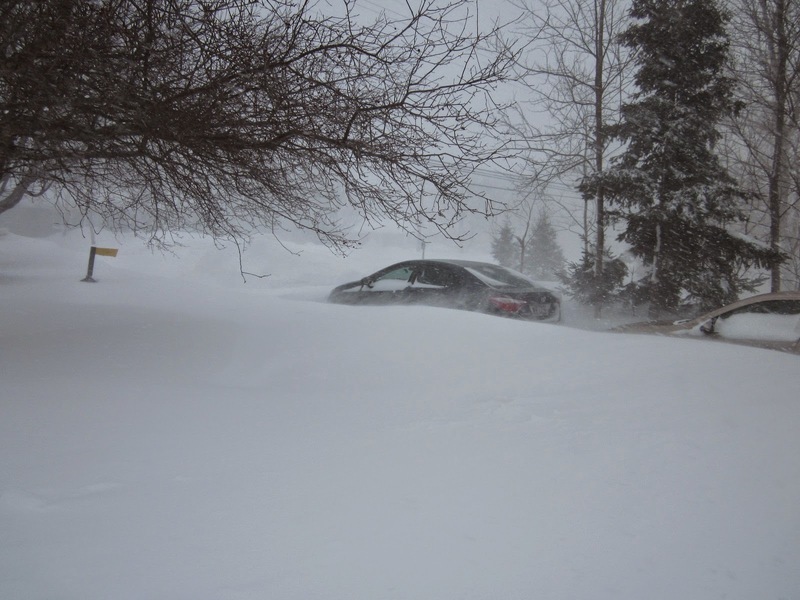 The high temp was -6 but a strong wind from the NW was causing a lot of drifting, some roads closed because of accidents. Schools closed again today, so that is a full week the schools have being closed. 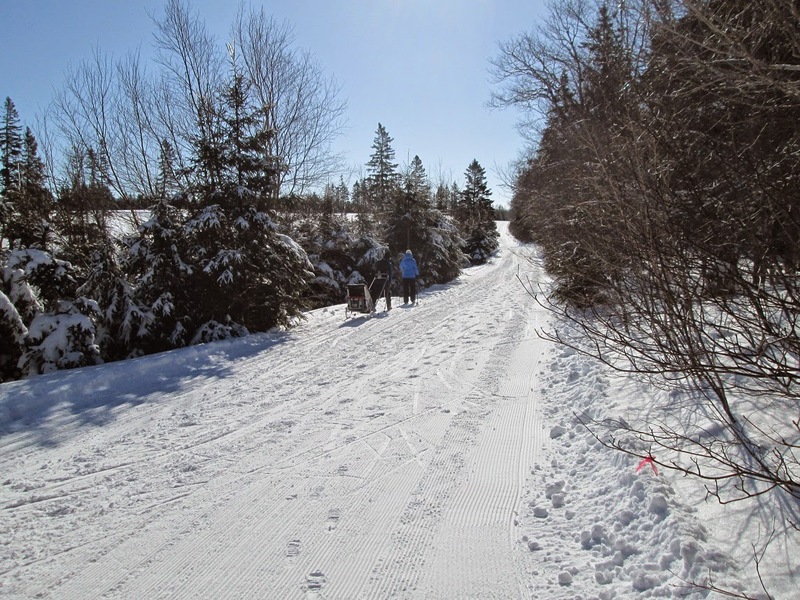 I was snowshoeing at Moore's Sanctuary in Milltown Cross today. Some open water at the pond, there was a flock of geese of about 3 dozen there. 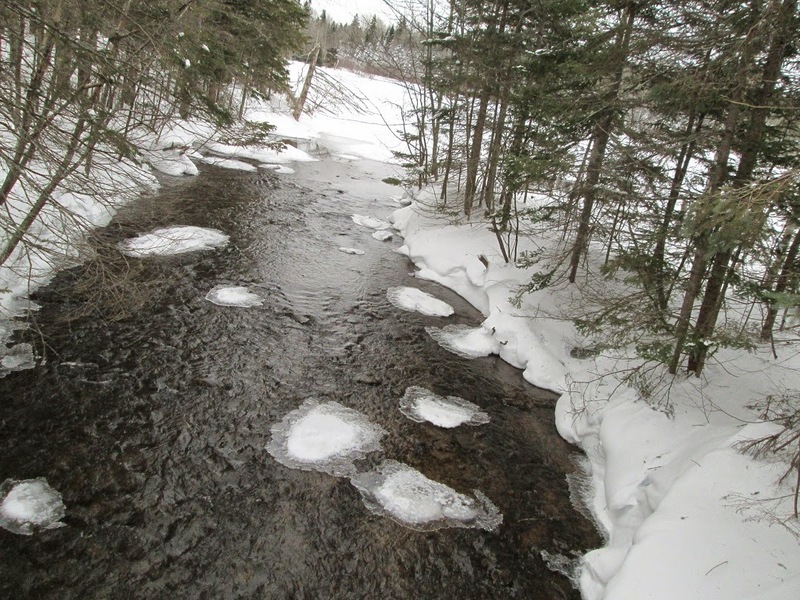 This is the outflow from the pond, a fair sized stream. 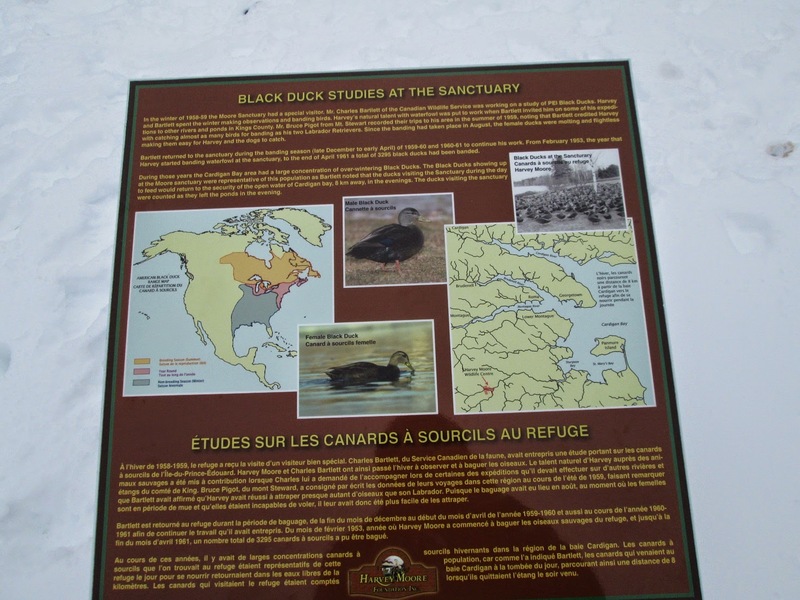 Some of the information plaques around the pond. It was overcast and a pleasant -4 with no wind. 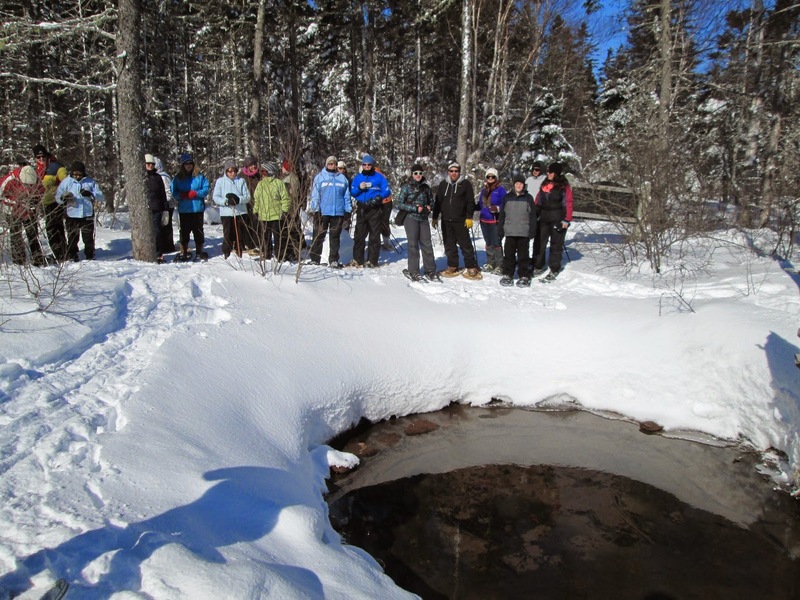 We were snowshoeing for about 90 minutes, a little longer that normal for this group. 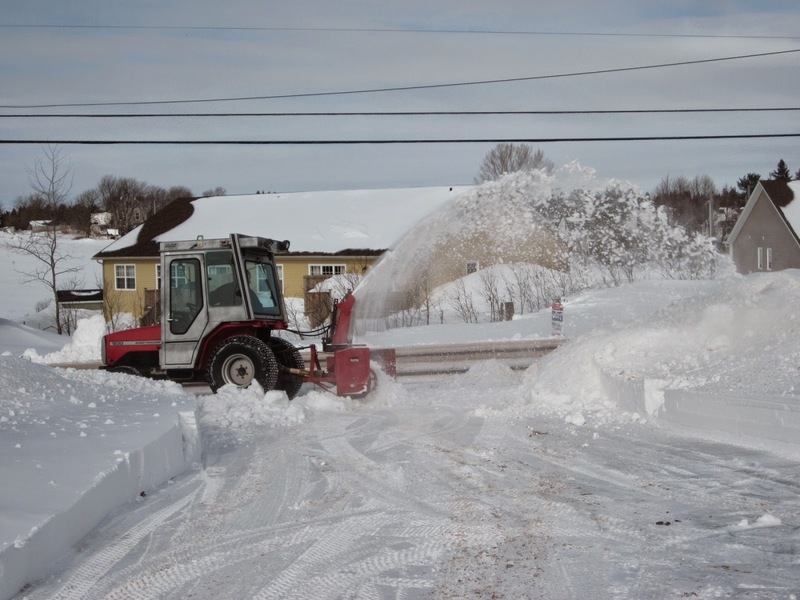 A neighbor using a little Massey to clear his driveway, he really doesn't have that much snow. 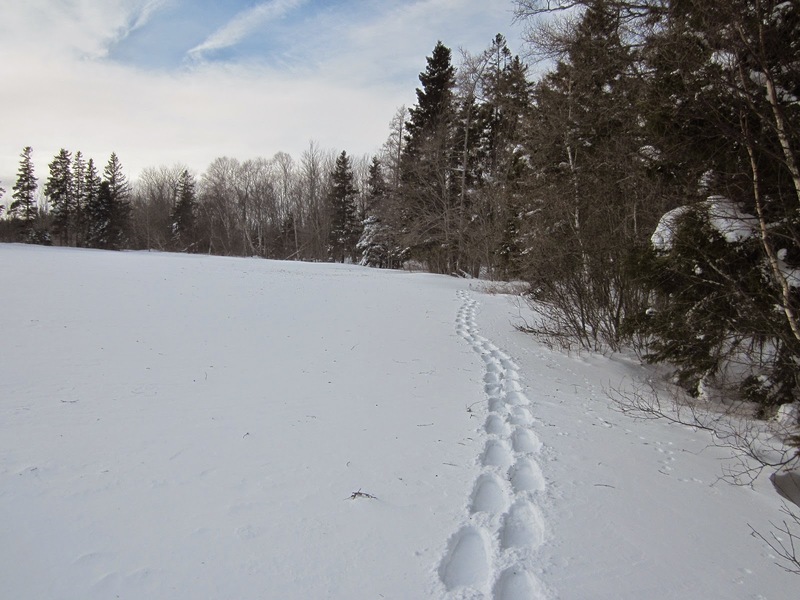 I was out on the snowshoes for 45 minutes, only tracks were mine from yesterday. This is a crossing of the little creek, there is a bridge under the snow but with so much snow I don't see either the bridge or the creek. Temperature was up to -5 with light wind. 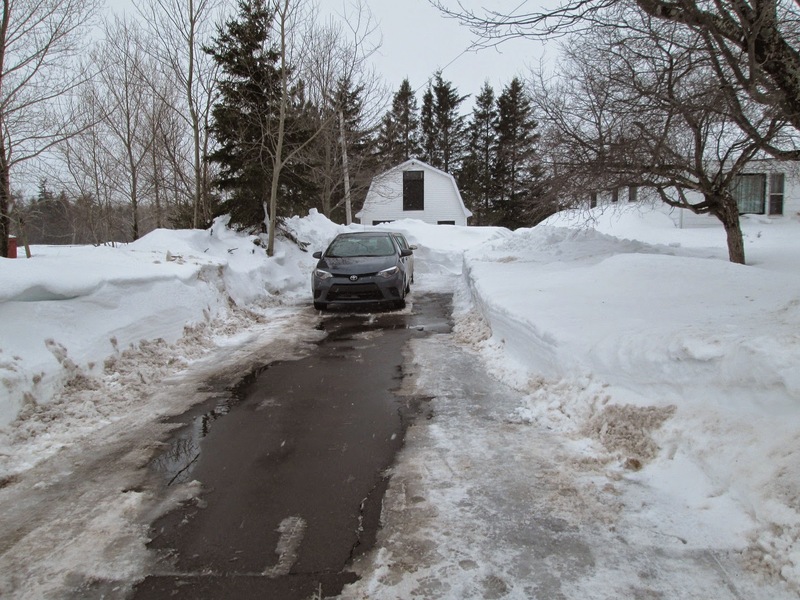 After a couple hours I have cleaned around my car and a meter wide track halfway to the road. My neighbor with a 100 hp case came to my rescue, it took him about 15 minutes. 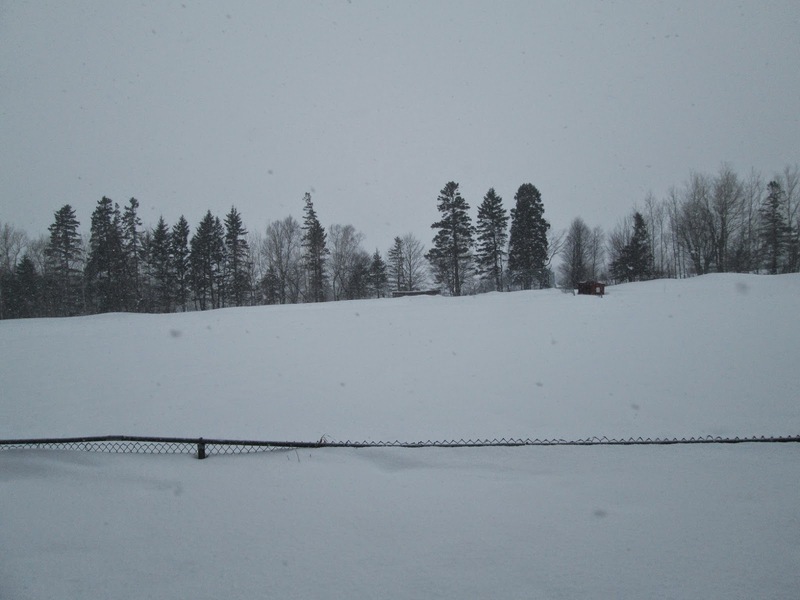 I then went out on the snowshoes, not much of the ball field fence showing. Can you see the fox sunning by the end of the fence? It was sunny at -10 with no wind. 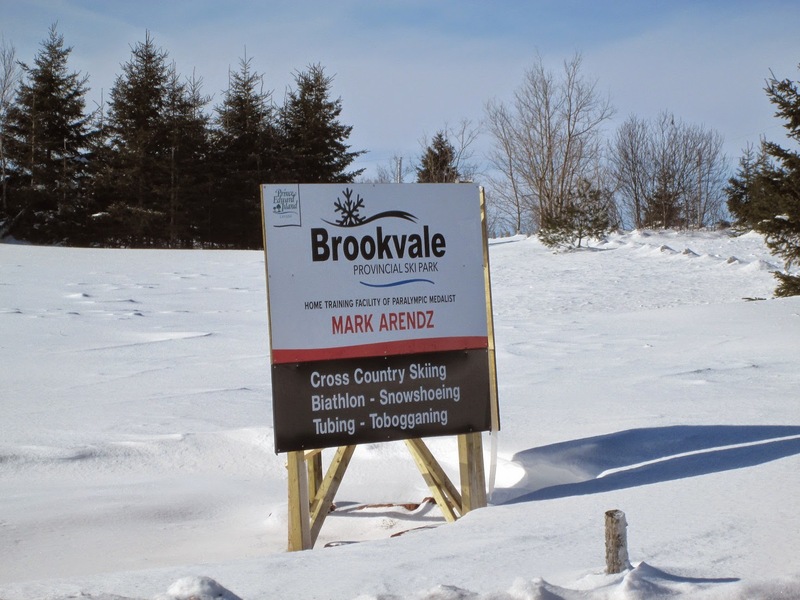 All schools and Government offices were closed for the day, also Church supper and Warren Grove cards cancelled for this evening. But the ladies curling is on. 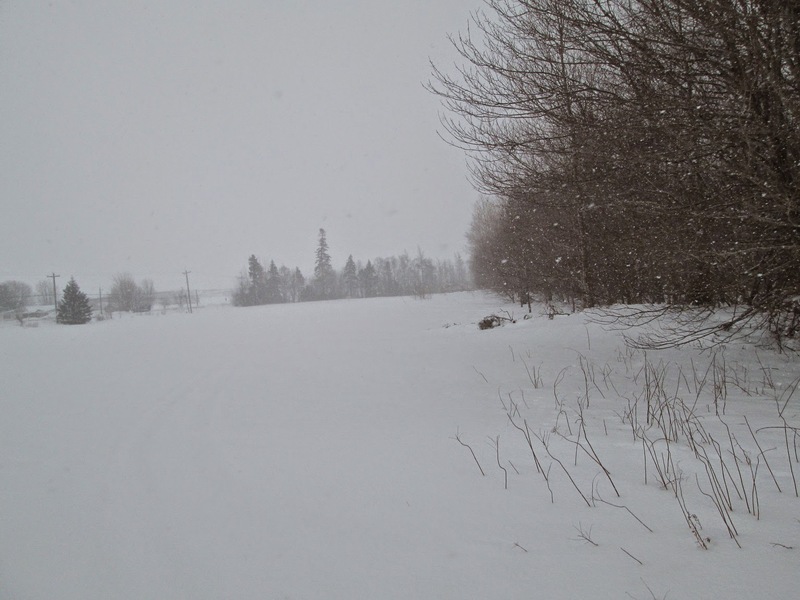 In the last 36 hours we received over 80 cm of snow with winds gusting as high as 110 km/h. 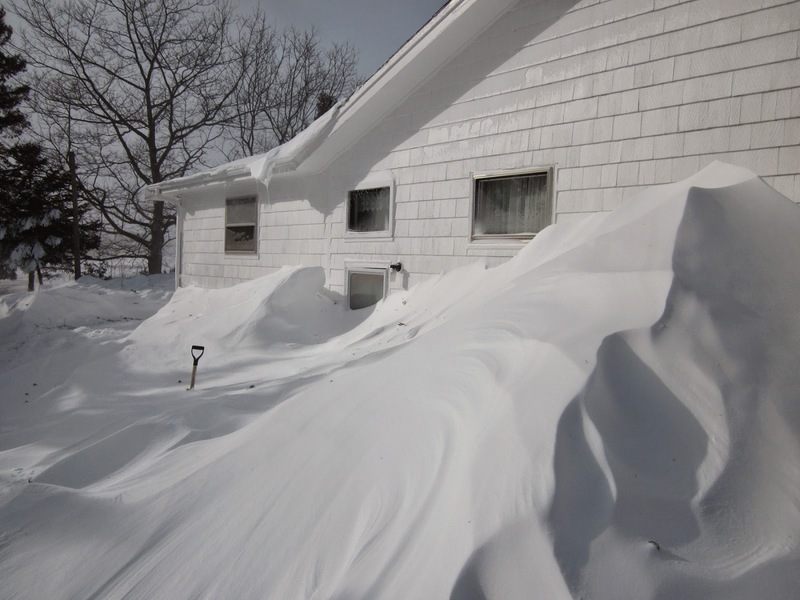 The back door is almost covered with snow. 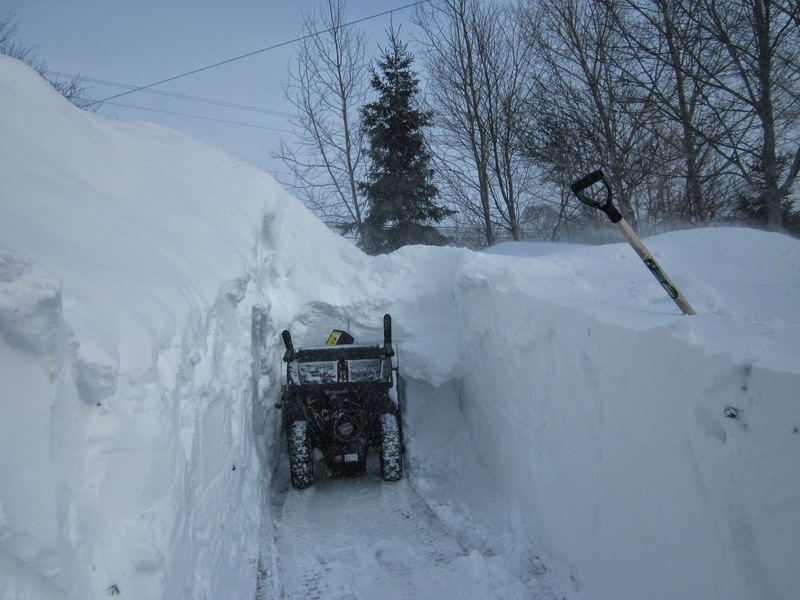 The snow drift is almost too much for the blower, I need to extend the chute by a meter to get the snow over the drifts. 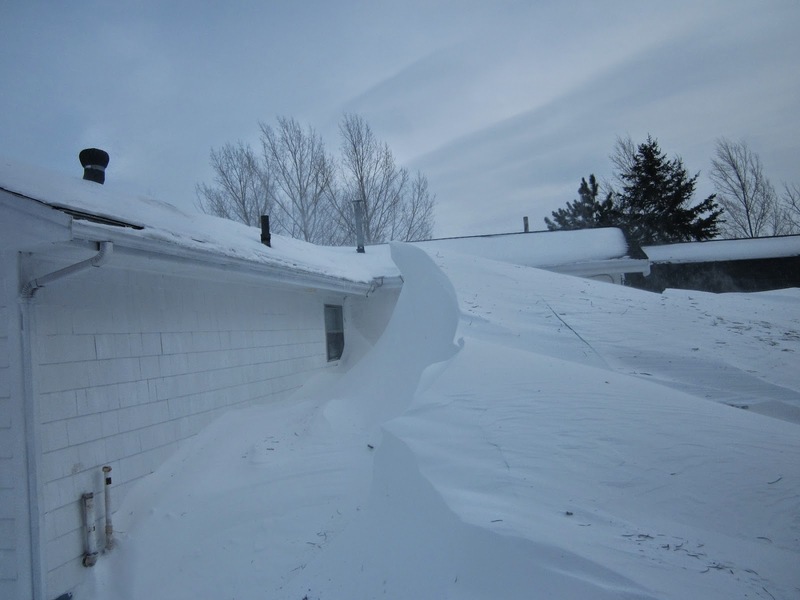 I have never seen a drift this large at the back of the house. 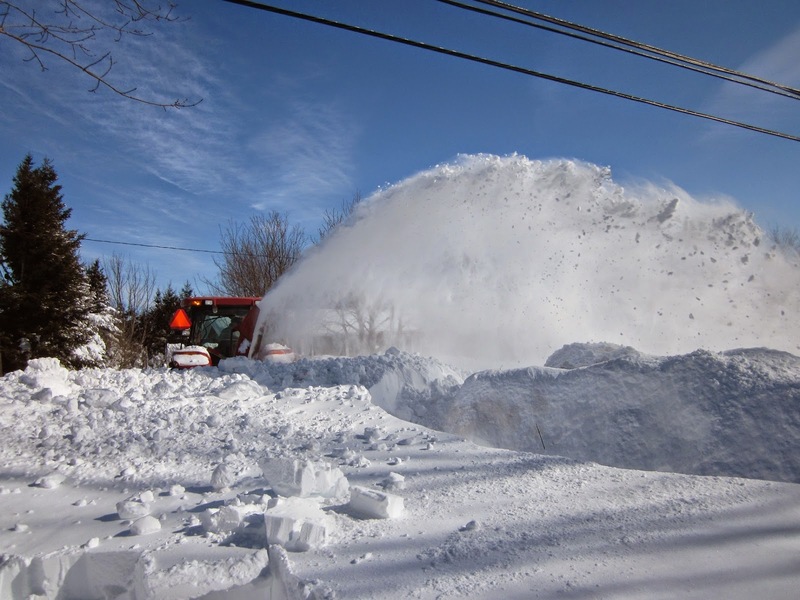 The first government plow just made the first pass on our road and it looks like a three meter high snow drift at the end of the drive. 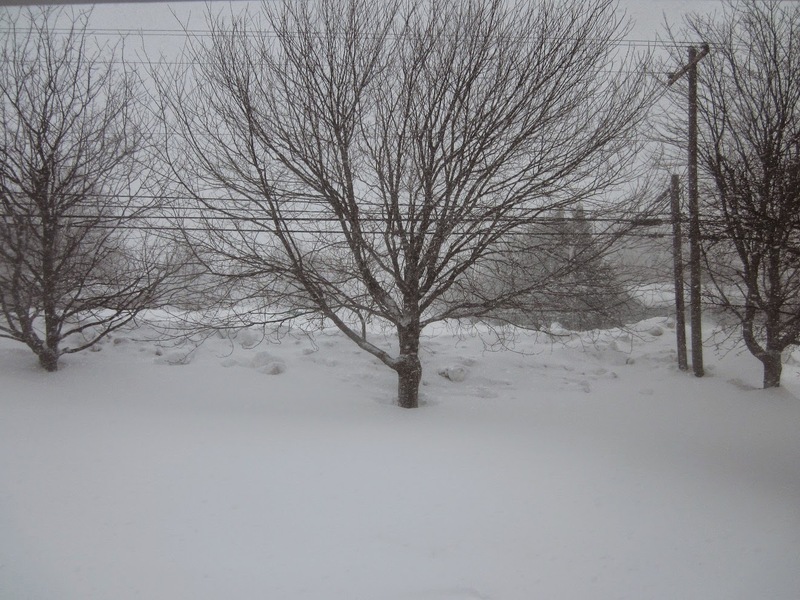 This photo was taken around 10:00 AM, The snow started about 7:00 AM. 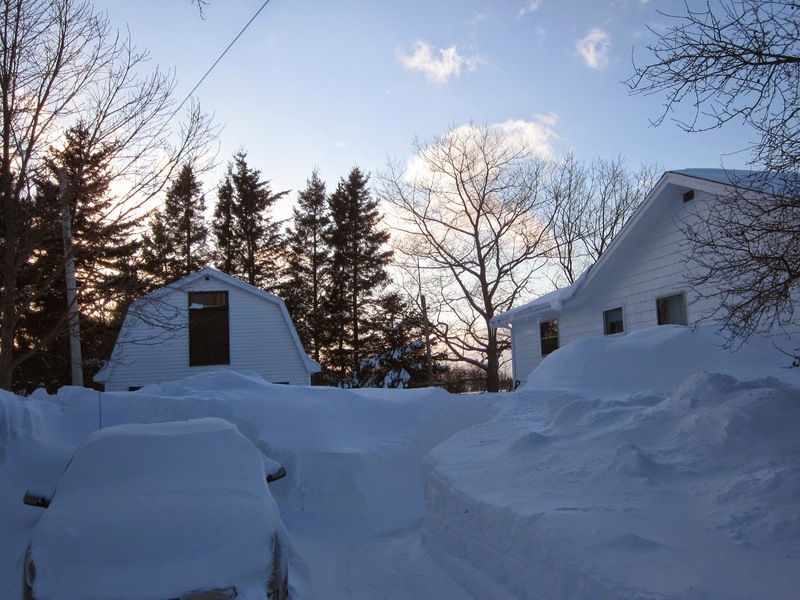 It was -12 overnight and up to -7 by 2;30. 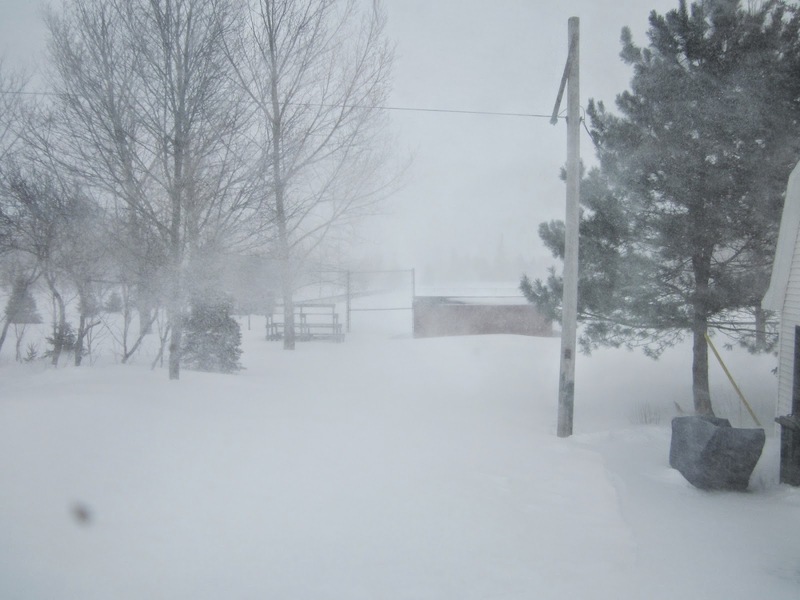 Over 30 cm of snow so far and winds gusting to 80 km/h from the NE. There was rain forecast for this evening but the temperature never got above -5 so no rain. 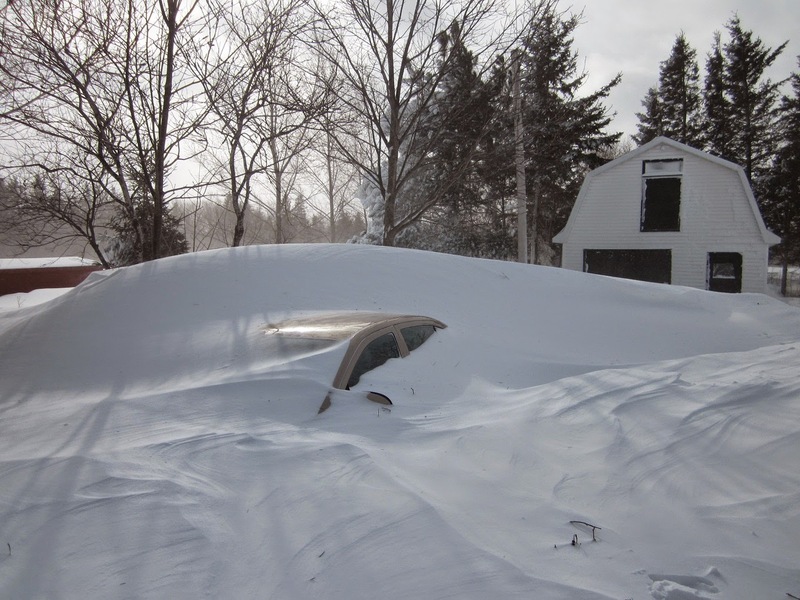 The forecast is calling for winds gusting over the 100 km/h overnight until noon on Monday. 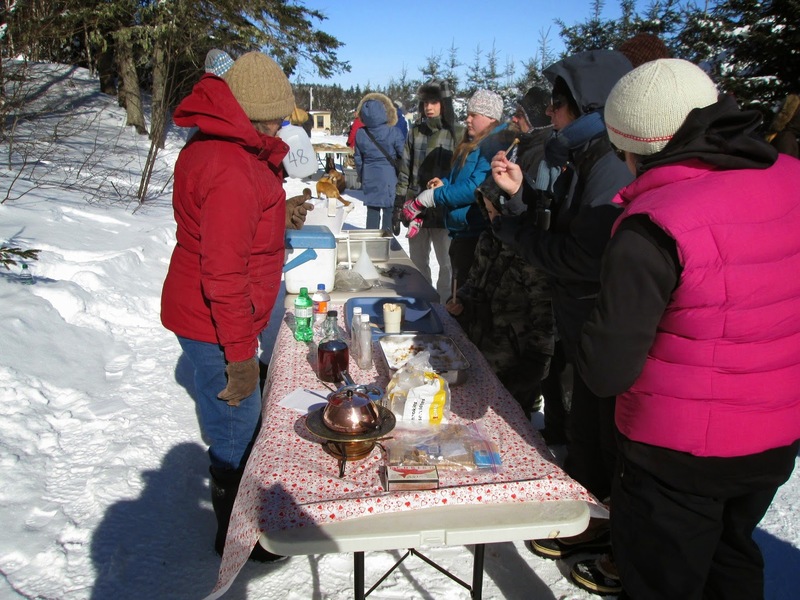 I was at the 2015 PEI Winter Woodlot Tour today. 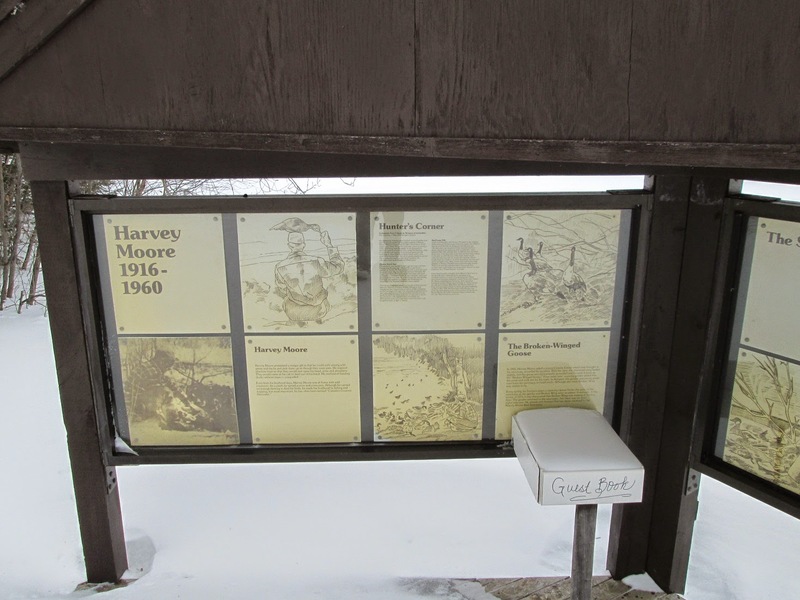 At this location you can borrow snowshoes if you want to try them. 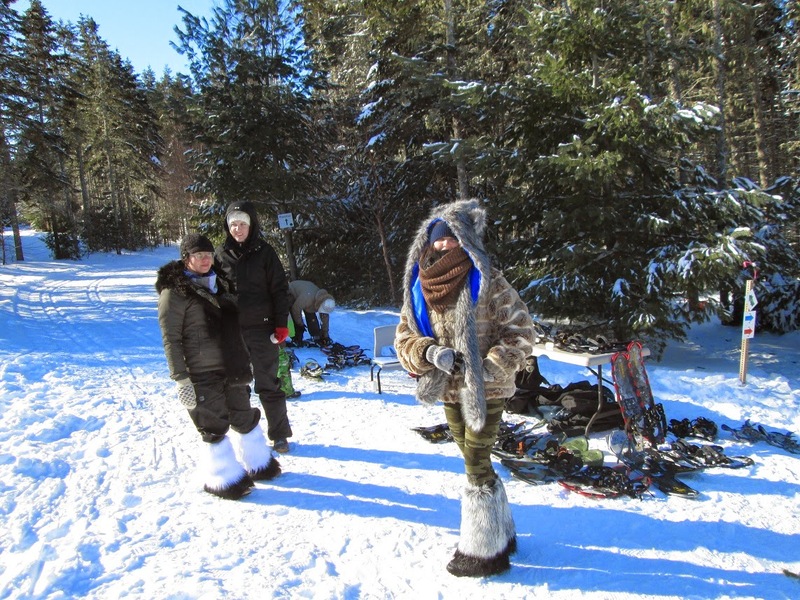 It was sunny but a -18 so they dressed warm. 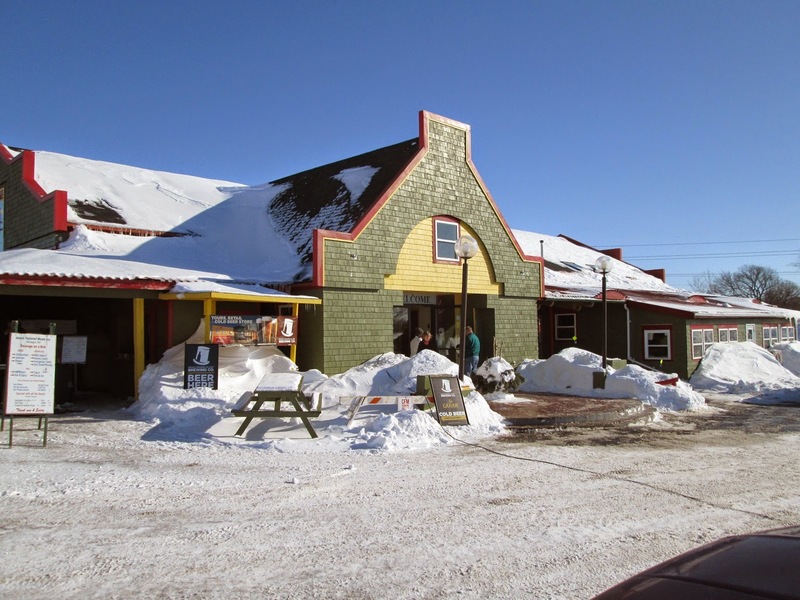 I got samples of maple syrup at this location. 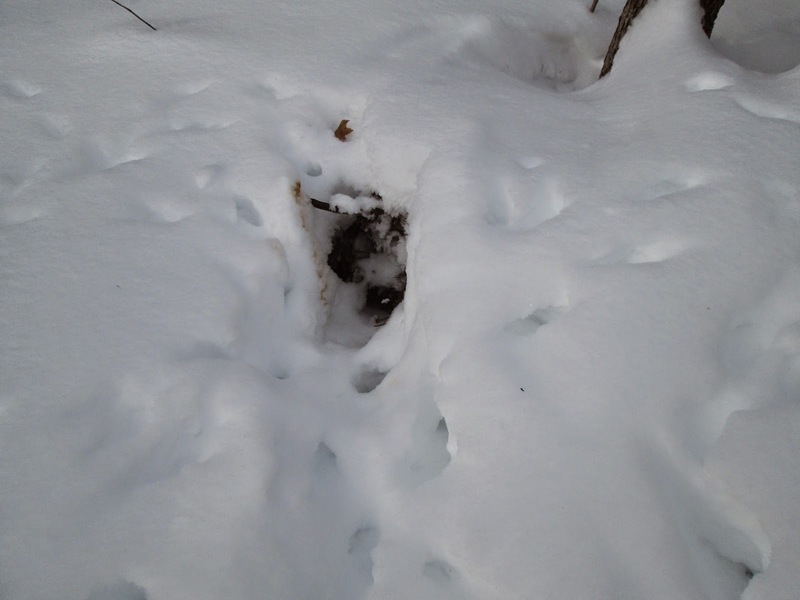 To me this is the opening to a fox den in the woods near the water tower. 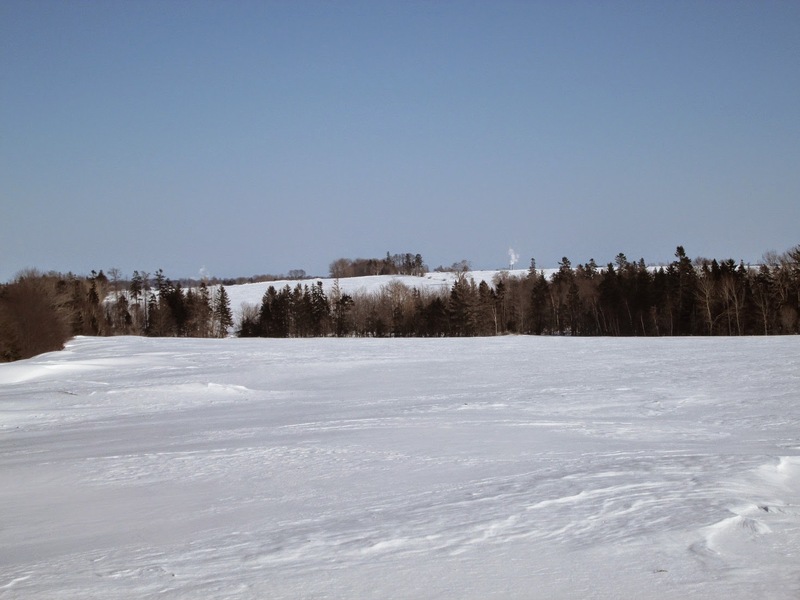 I was out on the snowshoes for a couple hours in the afternoon. 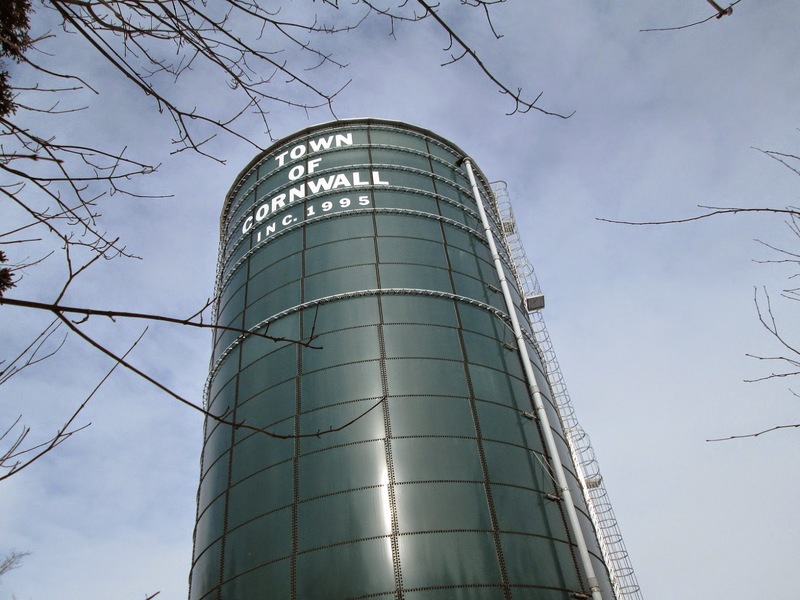 The business park trail takes you right by the water tower, it holds around 4 million liters. 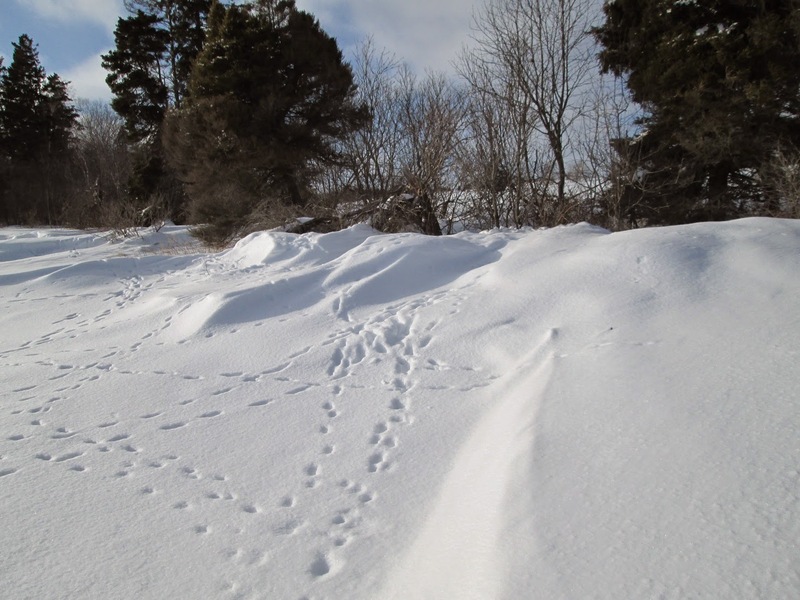 Lots of coyote tracks here, there is some old hay bales under the snow, so I am guessing there is a den nearby. Sunny at -12 with a 30-40 km/h wind so the windchill was -20.